Dell on Thursday announced a tablet with a 7-inch touchscreen, and said it plans to launch a 10-inch tablet later this year for business customers. 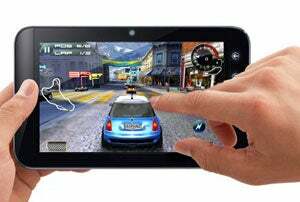 The Streak 7 tablet runs on Google's Android 2.2, and is powered by Nvidia's Tegra 2 dual-core processor. The tablet will can be upgraded to Google's Android 3.0 OS, code-named Honeycomb, soon after its launch, said Michael Tatelman, vice president at Dell, speaking at the Consumer Electronics Show in Las Vegas. "It weighs less than a pound, which is a lot lighter than some 10-inch tablets out there," Tatelman said. The tablet will be available through T-Mobile in the U.S. in the next few weeks and will work with the wireless carrier's 4G network. The tablet will be available for purchase through contracts or pre-paid plans through T-Mobile, though pricing information was not immediately provided. Dell plans to sell the Streak 7 globally, but Tatelman provided no further details on when it will be available worldwide. The Streak 7 tablet has a 1.3-megapixel front-facing camera and a 5-megapixel camera on the back. The display has a Gorilla Glass screen, which helps make it more sturdy. The screen is also used with Dell's Venue Pro rugged smartphone. The Streak 7 includes support for Flash 10.1 to play movies and games from the Internet. It has Dell's Stage user interface, which makes it easier to find movies, books and other documents. Dell also plans to announce a tablet with a 10-inch screen later this year for business customers, Tatelman said. The tablet will blend business-related software and services so that companies can remotely manage data and connect to offices. The Streak 7 tablet with be complementary offering to the current Streak, a mobile device with a 5-inch screen that includes smartphone and tablet features. Dell has also started shipping the Inspiron Duo, a netbook-tablet hybrid in which the 10.1-inch screen flips around to turn the device into a tablet. Dell also announced the its Venue smartphone, which has a 4.1-inch screen and an 8-megapixel camera. Unlike its existing Dell Venue Pro device, which runs on Windows Phone 7 and is for business users, the Venue does not have a slip-out keyboard and it runs on Android OS. The smartphone will be available unlocked on Dell's website in the next few weeks.